*Students are allowed to check out 4 books for a period of 2 weeks if their library record is clear. 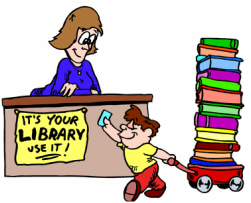 If a student owes a fine or overdue books, they will only be permitted to check out 2 books. * Books that are checked out will have a due date stamped in the back of the book. *A fine of $0.10 per day will be charged for books that are overdue. *If a book is lost or damaged, a replacement cost will be charged. *Books may be renewed up to 2 times. *Teachers may send individual students to the library with a pass. Ms. Wilson to bring their classes to the library.